Secretary of State Rex Tillerson wants to do away with special envoys focused on the Arctic and climate change, as part of his effort to overhaul the State Department. The proposal comes just months after Tillerson visited Alaska and spoke about the importance of the Arctic. Some worry it’s a sign the Trump administration will be less engaged in the region. 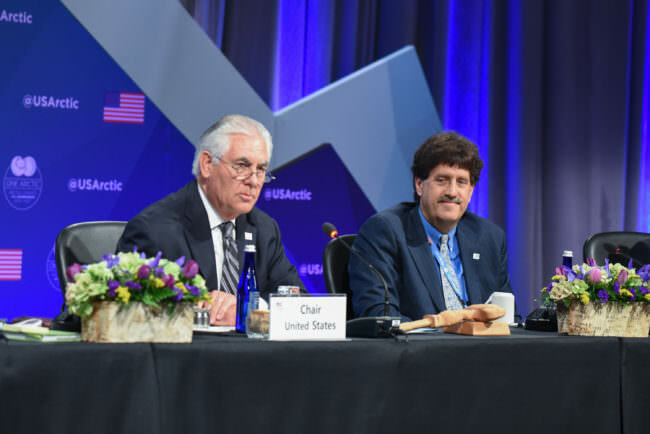 Tillerson came to Fairbanks in May to hand over the chairmanship of the Arctic Council, the main organization for cooperation among the world’s eight Arctic nations. “The United States has been privileged to lead the Arctic Council at a time when the Arctic region has been facing unprecedented change and challenges,” he told diplomats. The Council has focused on issues like increasing ship traffic as sea ice recedes, oil and gas development and rapid environmental change. But according to a letter first reported by CNN, Tillerson wants to scrap the position created just three years ago by the Obama administration to focus on the region. The Special Representative for the Arctic Region is one of about three dozen special envoys Tillerson hopes to eliminate or merge into existing bureaus. It’s part of a larger effort to streamline the State Department; the Trump administration has proposed cutting the agency’s budget by nearly a third. Mike Sfraga heads up the Polar Initiative at the Woodrow Wilson Center in D.C. He said the appointment of the special representative in 2014 was a sign the U.S. was taking the Arctic seriously. The position was part of a deliberate effort under the Obama administration to raise the profile of Arctic issues. Critics, including in Congress, say the State Department has too many special envoys, who duplicate work that could be done by existing bureaus. But Sfraga said he wishes the U.S. would hang onto this one. He said just about every other nation involved in the Arctic has an ambassador-level position focused on the region. “There simply is not somebody who the United States points to and says, ‘that is our point person, at the highest levels of the government, on the Arctic,’” Sfraga said. Still, the role was always nebulous. “I don’t know that the role comes with a job description,” said Nils Andreassen, who runs the Institute of the North in Anchorage. The only person who’s held the position is retired Coast Guard chief, Admiral Robert Papp. Andreassen said Papp focused on raising awareness of the Arctic, even within the U.S., and that kind of outreach will be the biggest loss. “He really felt strongly that if he could bring America to the Arctic and the Arctic to America, then being able to address all the challenges would be that much easier, because people would understand them differently,” Andreassen said. Also on the State Department chopping block: the Special Envoy for Climate Change. That position was also created during the Obama administration. Until last year, it was held by Todd Stern, who led the U.S. team that negotiated the Paris climate accord. President Trump has announced the U.S. will pull out of that agreement. Under Tillerson’s proposal, the responsibilities of both the Arctic and climate change envoys would be absorbed into the State Department’s Bureau of Oceans and International and Scientific Affairs.